We all want a clean kitchen but turning to harsh chemicals isn’t the best way to achieve this. Not only are they bad for the environment, but they are also costly. Instead, you can use natural cleaners for your kitchen. With just a few ingredients from your pantry, you can have every surface of your kitchen shiny, clean, and smelling nice. Cutting boards should regularly be disinfected, but usually get forgotten about. If you have a spare lemon around, simply cut it in half. Then, rub the lemon around on the cutting board. Be sure to squeeze a bit so that the lemon juice can penetrate any of the deeper cuts in the cutting board. Leave the lemon juice on the board for a few minutes. Then, simply wash with soapy water. The lemon will get rid of any lingering bacteria and you don’t have to worry about harsh chemical residue on your wooden cutting boards. If you have a garbage disposal in your sink, you can know that it occasionally gets pretty smelly. Take a leftover lemon, cut it into pieces, and then toss them down the disposal. Grind them up for a bit and you can instantly eliminate odors. 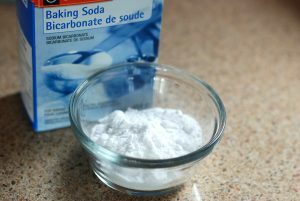 Baking soda serves a double whammy as one of the best natural cleaners for your kitchen. It can both disinfect and de-odorize. If you have stinky garbage, be sure to sprinkle some baking soda in the bin to cut down on odors. For grimy areas, such as tile grout, make a paste of baking soda and water. Spread the paste onto the grout and let it sit for a while. Then, with a cloth or even a toothbrush, start to scrub. The grout will instantly be a lot cleaner. Chances are you have stainless steel appliances in your kitchen. And chances are those elegant appliances are covered in smudges and finger prints. Simply mix 1 part water with 1 part vinegar in a spray bottle. Apply liberally to your appliances. Then, with a soft cloth, start to wipe away the marks. You can increase the potency of the vinegar to tackle harsher dirt. You can also use a paper towel to mop up any leftover residue. For the dishwasher, pour a cup of vinegar into the bottom. Run an empty cycle and the vinegar will help loosen hard water deposits. Include this in your monthly cleaning routine and you can increase the lifespan of your dishwasher. There are many essential oils that you can use to help fight bacteria in your kitchen. Tea tree oil is one of the most versatile. You can add a few drops to any homemade natural cleaners. It will help to kill bacteria and germs, and also smells nice.